DESCRIPTION: I think this is the prettiest snake in Florida. 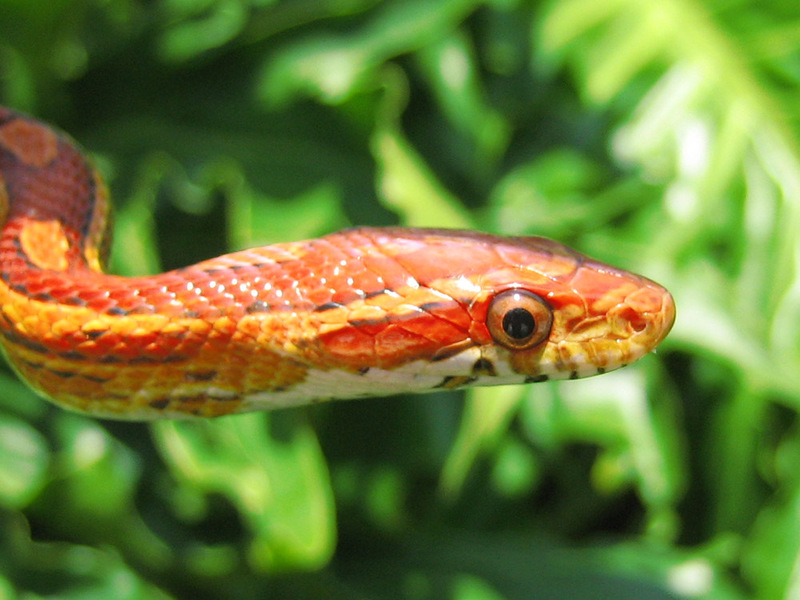 Corn snakes are often referred to as the red rat snake. They can be found all throughout central and southeastern United States. More primarily, they are found in overgrown fields and abandoned buildings. Farmers do not mind having these snakes around as they eat the vermin that threaten their crops. Due to the small size of these snakes, as well as their docile nature and reluctance to bite humans they are attractive snakes to have as a pet. They are simple to care for. Most adult Corn snakes are able to live rather comfortably in a tank that is 20 gallons. If you choose to use a 20 gallon tank, you will need to let your snake out so that they are able to exercise. A bigger tank is usually better for the snake such as 30 gallons or larger. Snakes have the ability of being escape artists and therefor you will need to have a screen top that is able to be locked. At least four locking clips will ensure that your snake remains in his home. The best substrate for your snake’s tank is newspaper. This is relatively cheap and easy to find. Dirt from the outside is usually not recommended as they can harbor parasites and bacteria. Your Corn snake will need a box that allows them to hide when they feel insecure. These hide boxes can be a small hollowed log that is purchased from a pet store, a cardboard box with a hole cut into it or other types of hiding toys from a pet store. Your Corn snake will need a climbing branch that should be purchased from your pet store. For the same reasons as dirt, you will usually not want to use a branch from outside as it can be dangerous to the safety of your snake.